Does Apple have Blu-ray playback software? VLC is a popular cross-platform open-source media player. You can find VLC on different platforms like desktop operating system including macOS, Windows and linux and mobile operating systems including Android, iOS, and Windows 10 Mobile, etc. No, it doesn’t. Apple had never taken Blu-ray seriously. The company didn’t really care to release a computer with a Blu-ray drive, not even once. The company only had a DVD drive featured in some of its Mac computers and laptops which had been put to an end recently. Apple had stopped giving DVD drives to users in order to make its computers slimmer and lighter. The last MacBook that you can find with a DVD drive in it is the Mid 2012 MacBook Pro 15, which Apple had stopped selling in 2016. So it’s only logical that you won’t find Blu-ray player software on a Mac computer. One of the reasons why it’s so popular is because it’s free. Since Apple’s never been fans of Blu-ray, which can be seem from its attitude towards Blu-ray, you shouldn’t expect Apple to give you an official player on Mac to play Blu-ray, which it doesn’t. So a third-party Blu-ray drive and Blu-ray player app is needed. Some Blu-ray player apps on Mac are not free, if you don’t want to pay for it, then VLC is the one you want to go with. But VLC doesn’t support playback of Blu-rays, not without some modification. There are things you can do to make VLC play Blu-ray discs on Mac, and it’s fairly easy to make that happen. To enable VLC to play Blu-ray on Mac, here are all the things you need. Step 1. Go online, find the latest version of VLC, download it and install it on your computer. There are a lot of websites that offers VLC. But for the sake of safety, you can go to VLC’s official site: videolan.org to download it. Step 2. Open the following link with your browser: http://vlc-bluray.whoknowsmy.name/. Find the KEYS DATABASE(KEYDB.cfg) and the AACS DYNAMIC LIBRARY(libaacs.dylib for mac) on it and download them to your Mac. Step 3. 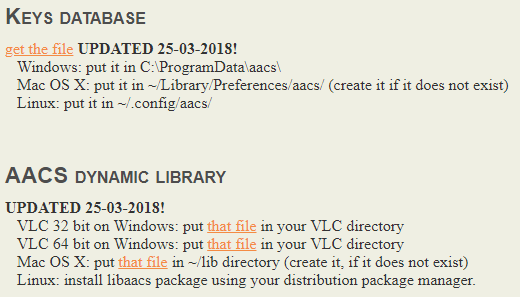 Move the KEYDB.cfg file to ~/Library/Preferences/aacs folder and the libaacs.dylib file to the ~/lib directory folder. The ~ symbol refers to home directory. If you can’t find the ~/lib folder, create it by yourself, it’ll still work. After the two files are put in the right location, you can connect your Blu-ray drive to your Mac and put your Blu-ray disc in it to play start playing Blu-ray on Mac. With the two files above, you also get to play a Blu-ray ISO file or a Blu-ray folder with VLC on Mac if you have them. With all the works above done, it’ll become VLC Blu-ray player Mac users could use for Blu-ray playback. Note that VLC currently doesn’t support Blu-ray menus, so it’ll require you to select which title to play manually. Another way to use VLC to play the Blu-ray movie on Mac is to rip the Blu-ray to a VLC-compatible format on Mac. Considering that VLC is an open-source video player, you can convert the Blu-ray movie to videos in a lot of different formats to play on Mac. 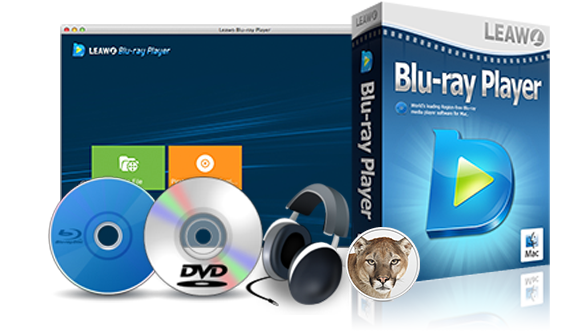 To get the best out of the Blu-ray movie, you should get a high-quality Blu-ray ripper to make a high-quality digital copy of your Blu-ray disc on Mac. It would be ideal if the Blu-ray ripper can create a lossless copy of your Blu-ray movie to watch on your Mac computer. There are programs that can do something like that. One of them is Leawo Blu-ray to MKV Converter for Mac. It’s a top-notch Blu-ray ripper program that can convert the Blu-ray movie to a lossless MKV video which packs all the original data in the MKV container without compression. It’ll allow you to enjoy the movie with the highest quality without needing the Blu-ray disc and the Blu-ray drive every time you play the movie. ☉ Rips Blu-ray of all sources to lossless MKV. ☉ Able to rip protected Blu-rays. ☉ Saves all audio tracks and subtitles you need. 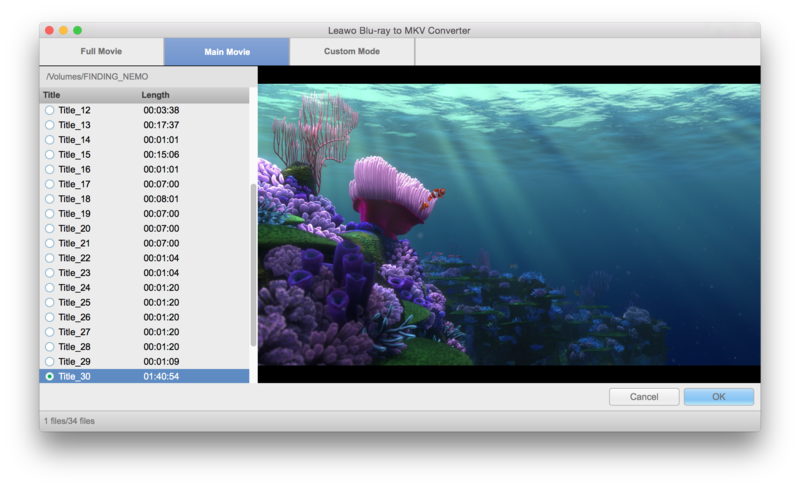 Here’s how to make a lossless MKV video from your Blu-ray movie using Leawo Blu-ray to MKV Converter for Mac. 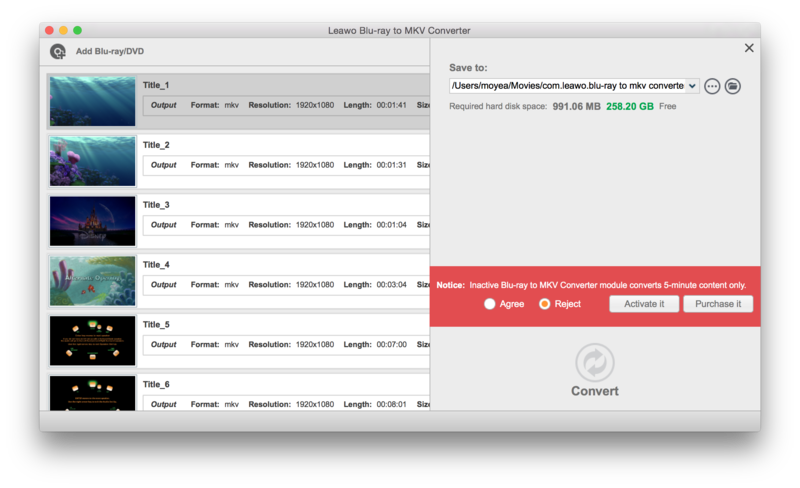 Put the disc you want to rip to your Blu-ray drive and kick off Leawo Blu-ray to MKV Converter for Mac from the launch pad. And then on the interface, find the Add Blu-ray/DVD button in the top-left corner. Click on the Add Blu-ray/DVD button and then click Add from CD-ROM from the drop-down menu that follows. Click on the following option to load the content of the disc to the converter for further processing. When the program finishes loading the content of the disc, it’ll show you all the video titles in the disc on the left side of the interface. To the right of the video list is the video player which you can use to play videos on the left. To play a video, just double-click a video title on the video list. Above the video list you will find 3 buttons: Full Movie, Main Movie and Custom Mode. Considering that you might not want to rip all the videos, the 3 options are for you to pick different video titles to rip. Full Movie button will select all the titles on the list for ripping. Main Movie will only select the main movie to rip. Custom Mode provides you with the option to pick multiple video titles you need by yourself from the video list. After choosing the video you need, click the OK button below the video player and it will take you to the interface where all videos you chose from this step will be listed in. You can see a Subtitles option and a Audio option on each video. Click on one of the options and a drop-down menu would appear with all the audio tracks and subtitles included in that video. You can pick the audio tracks and subtitles you like freely on the drop-down menu to save in the output MKV video. If you want to play a video, just click the Play button which you can find on the thumbnail of the video on the left. During playback of a video, you are also allowed to choose different audio tracks and subtitles for it. In the upper right-hand corner of the interface you can see a green Convert button. Click on this button and a sidebar would pop up from the right. The default output directory is shown on top of the sidebar. You can change it to a new directory if you want. When you are done setting up the output directory, click the Convert button on the sidebar to let the program start to convert the Blu-ray movie in your disc to MKV. 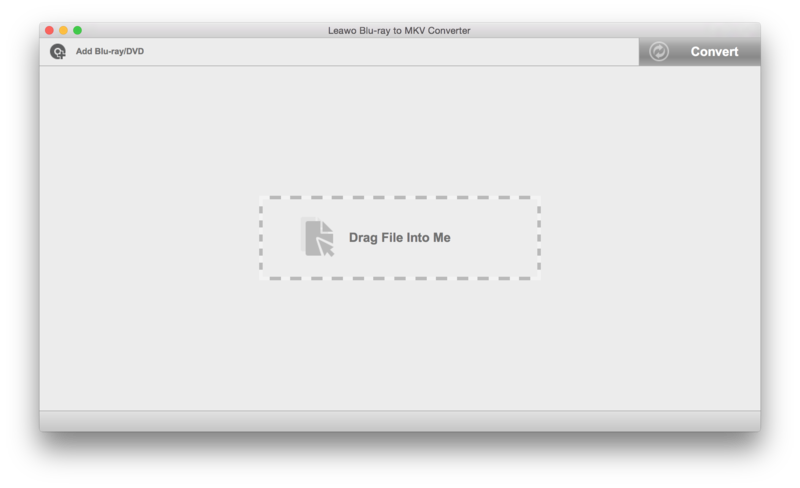 Below’s the video guide of Leawo Blu-ray to MKV Converter for Mac. 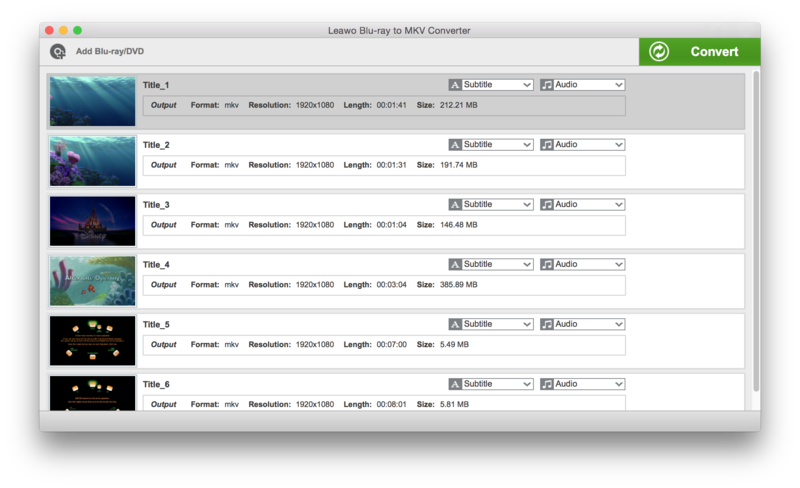 The lossless MKV video you get from Leawo Blu-ray to MKV converter can be played directly with VLC video player. If you like, you can also transfer the MKV video to your iPhone or iPad and use a third-party video player to play the MKV video on them. What’s great about converting the Blu-ray movie to MKV is that you don’t have to look for the Blu-ray disc and the Blu-ray drive every time you want to watch the movie. The only thing is that the lossless MKV would be large and take up a lot of your storage space. If you don’t mind that, then it’s a great way to watch Blu-ray on your Mac. If you like watching movies on your iPhone or iPad, check out Leawo Blu-ray Ripper for Mac, it can rip Blu-ray to MP4 on Mac with high quality. There isn’t much Blu-ray player software available to users for free. 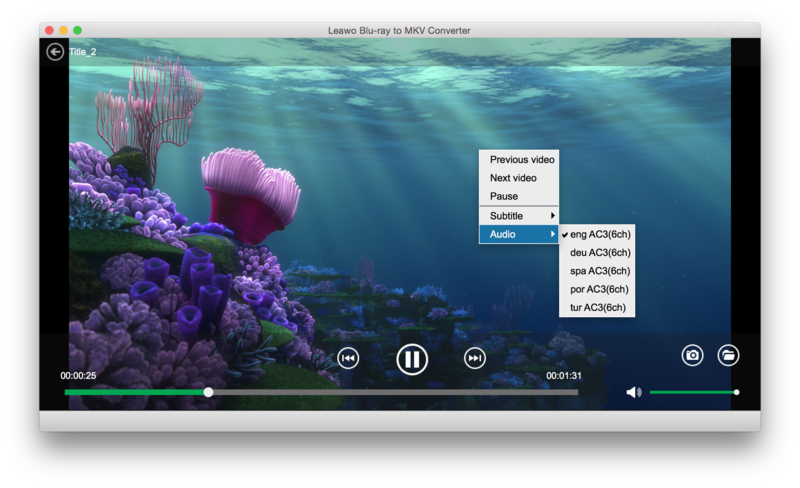 Other than VLC, you can also try Leawo Blu-ray Player for Mac. Here’s why. It’s compact as well as powerful. It can play encrypted Blu-ray/DVD disc directly. And you can also use it to play some videos in formats that are not supported by QuickTime and iTunes like RMVB and WMV. And it’ll only take up 4% of your CPU’s processing power to play a Blu-ray disc, meaning you can do other things while watch the movie without the player slowing you down. Frankly, I think it’s a superior choice to VLC for Blu-ray player software as you don’t have to spend time and effect to make it work with Blu-ray. Just download the program, install it and start playing Blu-ray movies with it. It also has a Windows version that works on Windows 7/8/8.1/10. If you have a Windows computer running Windows 10, you might need this program as like macOS, Windows 10 also doesn’t have Blu-ray player software pre-installed. With it you can easily play Blu-ray on Windows 10. ☉ Supports playback of all kinds of Blu-ray/DVD discs. ☉ Supports a wide range of video formats. ☉ Low CPU processing power consumption. How to rip DVD to MKV with Handbrake? How does Oppo find X perform in HD Blu-ray playback? Is It Legal to Rip a DVD? How to get digital copy of a movie I already own?